The contemporary Plush brand covers three lounge bar/nightclubs based in Andover, Basingstoke and Bournemouth, as well as a fourth bar operating under the Puressence brand in Bournemouth. 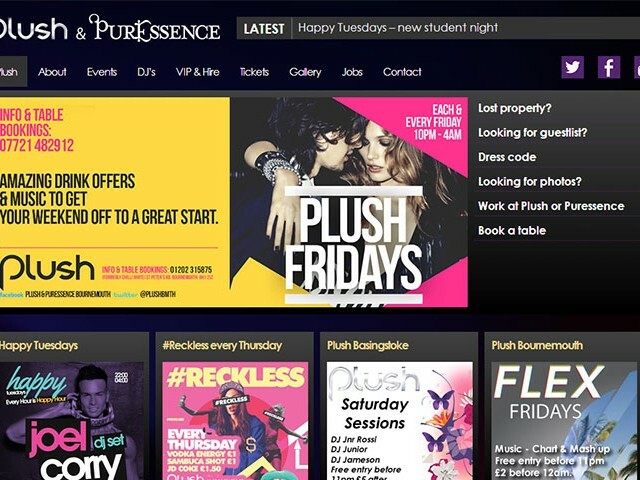 The website for Plush Lounge Bar includes news, event dates and VIP table bookings for all the bars in one comprehensive and tailored site suite, using a clean and intuitive UI, developed especially to allow simple and effective bookings from a calendar for all venues. This is a feature rich site and a brilliant example of user experience and functionality made simple and effective.